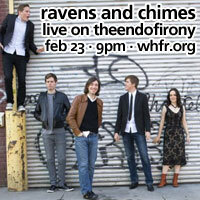 Ravens & Chimes came to visit The End of Irony on WHFR two weeks after MC Steinberg. The two acts couldn't have been more different, highlighting the truly diverse acts that would eventually be brought in over the year. This performance is particularly beautiful.